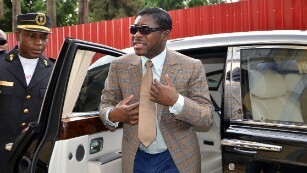 Brazilian authorities seized more than $16 million in cash and luxury watches from a delegation traveling with the vice president of Equatorial Guinea, according to local media reports. Teodoro Nguema Obiang Mangue, the son of the nation’s longtime leader, was part of a 11-member delegation that traveled to the South American country. About $1.5 million in cash and luxury watches valued at more than $15 million were seized by Brazil’s federal police after searching their private plane, which arrived at the Viracaspos airport near Sao Paulo on Friday, a Brazilian newspaper media reported. Brazilian laws do not allow people entering the country to have more than $2,400 in cash. The 48-year-old vice president is the only member of the group with diplomatic immunity who was not included in the search operation. Officials searched the plane and luggage of other members of the group, according to daily newspaper O Estado de Sao Paulo. The luxury watches engraved with Obiang’s initials, according to the report, are for the vice-president’s personal use, the official added. Brazil’s Foreign Ministry said it was working with federal police and customs to determine steps that will be taken on the case, according to media reports. In 2014, the vice president sold his Malibu mansion, a Ferrari and paid $20 million to a charity as part of a settlement deal following allegations that he had used public funds to amass the assets in the United States. He was sentenced last year in France to a three-year suspended sentence on charges of embezzlement of public funds and money laundering. Obiang’s father — Teodoro Obiang Nguema.– has ruled the country for 39 years.